G.James recently worked with Saltwater Constructions to install a glass floor panel in a new home located in an inner city Brisbane suburb. 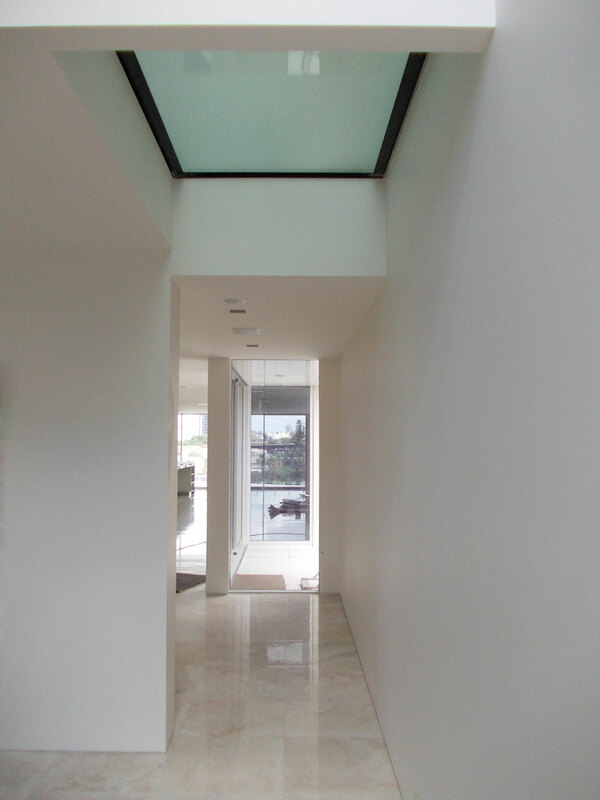 The goal was to provide a non-slip glass floor that would allow natural light to better enhance the living areas throughout the home. G.James currently has the widest range of non-slip glass flooring products in Australia. The glass flooring products we provide are made of multiple panels of glass laminated together, to provide a strong and safe glass you can stand on. These products can be used in both flooring and staircase projects to good effect. The particular glass used in this project is “Lunaris-X” in our GripLite range. This is an extra non-slip glass, ideal for use in flooring projects. The X after Aluminium, Incus, and Lunaris stands for eXtra Non-slip – making them ideal for both internal and external use. These patterns also have an Acid Etch finish, which enhances their slip resistance, reduces scratch-ability, and stains, as well as providing a degree of opacity. Lunaris-T has a transparent finish which offers a clean, aesthetically pleasing appearance. It is suitable for internal use only. In addition to floor panels, these products can also be used in a staircase, providing a unique look that is safe – due to the excellent slip resistance, as well as practical – regular stair cases can require significant amounts of artificial lighting, the natural light transmitted by glass stairing increases the usability of the space around and below the staircase. Our glass flooring products have been tested by Independent Slip Testing Services to the Australian Standard AS/NZS 4586.2004. To find out more, please visit our glass flooring gallery, or contact G.James Glass Sales on (07) 3877 2866. This entry was posted in Glass and tagged Anti-Slip Glass, Glass Floor. Bookmark the permalink.